With 55-plus years of history, the Rolling Stones continue “pushing the envelope,” as Keith Richards was quoted. With the new “Exhibitionism” installation and public exhibit at Chicago’s Navy Pier, running Apr. 15 thru July 30 (www.stonesexhibitionism.com), the project is more of a stroll through their cumbersome history. One visits a re-creation of their dingy 1961 apartment, memorabilia, what it’s like to be backstage, and performance clothes, not to mention loads of photos. However, it’s best to remember the music they produced over that timespan which is oddly pushed to the periphery with the exhibit. Eagle Rock Entertainment has been working with the Stones management, and band members, over the past decade in releasing audio and visual items that are prized by collectors. There are roughly one dozen rare videos concerts that have been floating around for years in varying degrees of quality. Packaging for each piece is as varied as the formats: Blu-Ray provides bonus features, some sets include audio CDs of the program, even limited edition vinyl LPs make an appearance. All are well worth the investment, but let’s look at two DVD programs: Live At Hampton Coliseum 1981, and Live At The L.A. Forum 1975. 1981 was the year of “Tattoo You” and the resulting “Still Life” tour, where this item originated. It was Richard’s birthday show, and also the first satellite broadcast on pay-per-view. The Blu-Ray has additional footage of the pre-show shenanigans in the dressing room, a jam with George Thorogood, the opening act. The DVD, however, is jaw-dropping in itself by presenting the full 2 ½-hour concert uncut. The visuals are afforded a bright, clear and beautifully clean transfer and remixed audio from the digital feed and the multi-track tapes. The L.A. Forum show is the one piece of note, having been in circulation through numerous versions of bootlegs, both video and through the legendary Mike Millard audio recording “Tour of the Americas 1975” box set, from July 12. The late Millard would purchase handicapped tickets, arrive in a wheelchair and be placed close to the stage’s venue, giving a prominent position to record from the stereo microphones hidden in his safety flag poles on either side of the chair. Numerous Led Zeppelin, Pink Floyd, and Mc Cartney shows were captured in spectacular sound quality using this method. The video first mad its appearance in the 1980s in a truncated form, titled “Hot N’ Nasty,” giving a glimpse into what must have been an insane program. Later, 90-minute versions, and finally the full-length concert began its circulation. Fans have tried to lend their own acumen on equipment to clean the muddy picture, and expand the tinny soundboard feed that was equally muddy. All the efforts brought checkered results. “Hot N’ Nasty” kicked off with disclaimers that it was privately shot, and follows a Chinese lizard-dragon working its way across the stadium floor, as it was the Year of the Dragon. The famous “lotus petal” stage began to unfold to the tune of Copeland’s “Fanfare for the Common Man,” with Mick Jagger jumping up and down on one of the hydraulic petals to rev up the crowd. “Honky Tonk Women/ If You Can’t Rock Me/ Get Off My Cloud” played as a medley, was a good opening salvo. The Stones had a lot to prove, as the tour served to introduce Ron Wood, from Faces, as the guitar played replacing Taylor. He was also Richard’s running buddy, at the time, having previously auditioned Jeff Beck, Harvey Mandel, and Wayne Perkins for the slot. For geeks, here’s the bottom line: if you are mildly interested in the Stones, this is for you. Working with videotapes made more than 40 years ago, the visual restoration is very, very good. It’s still from videotape but the colors are now vibrant and time-corrected, the fuzziness is not present, and when compared to the most prestigious bootleg version with the same name, there is no comparison. The audio is the revelation. Mixed from the original multi-track tapes, it is now “in your face.” Bill Wyman, the bass player, is the proxy archivist of the band. How they sit on these things, and keep it quiet is interesting. For a sample of the 1975 show, a clip of the song, “Star Star” is on You Tube. This is really a beautiful time capsule and gives the flavor and feeling of being in the stadium, with about seven camera angles including backstage looking to the crowd. “Sympathy for The Devil” closes out the show, with drummers and dancers hopping to the tribal beats. 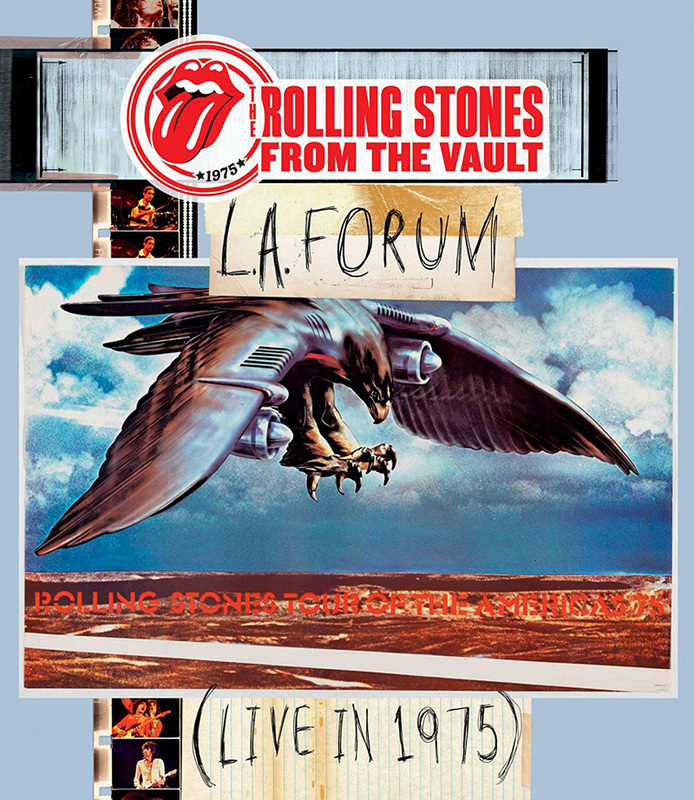 Check out the full stable of the Rolling Stones vault series at Eagle Rock Entertainment.